Beautiful 19th-century homes, family-friendly amusement parks with thrilling rides, fascinating museums, and miles of soft sandy beaches are among the many attractions in Galveston. 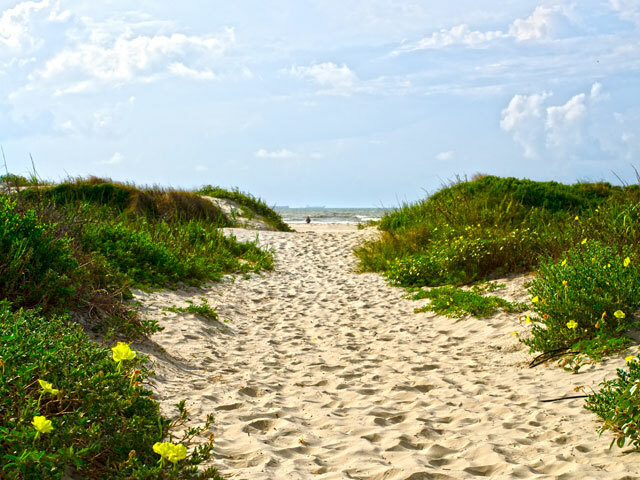 Located about 50 miles southeast of Houston, Galveston is an easy-to-reach getaway popular with beach loungers, nature lovers, anglers, and anyone looking for a great time. 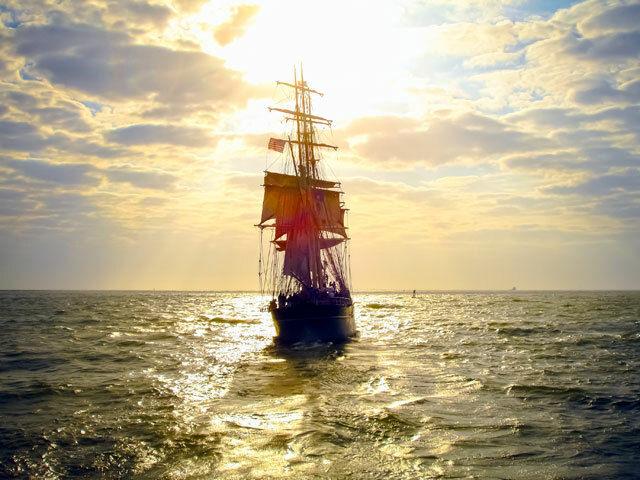 To discover what the island really has to offer, check out the following list of attractions in Galveston so you don’t miss out while you’re here. 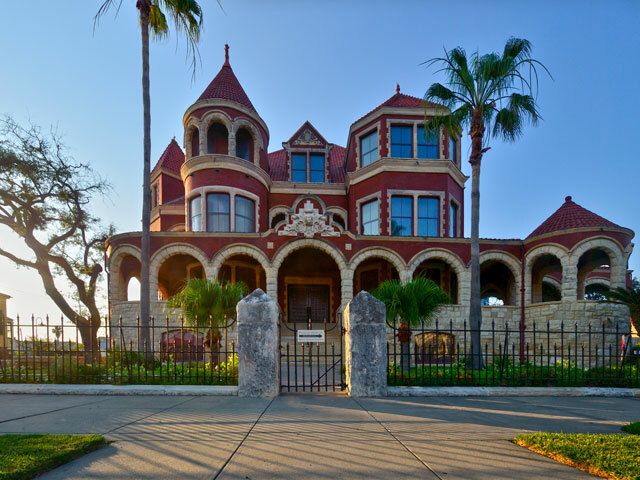 With its grand Romanesque-style arched entryway, rough stone façade, and metal beams, the 1892 Bishop’s Palace is one of Galveston’s most breathtaking homes. Built for Walter Gresham, one of the founders of the Gulf, Colorado, and Santa Fe Railroad, the two-story home has a mahogany stairwell, marble columns, and other extravagant details. Perched on a pier over the rolling surf of the Gulf of Mexico, Galveston’s historic Pleasure Pier combines all the fun of an amusement park and the appeal of the beach to create something unique. With more than a dozen rides, Pleasure Pier has rides suited for all ages. Add in the Midway games, an entertainment stage and on-site dining at the first Bubba Gump Shrimp Co. restaurant in Texas and you’ve got more than enough fun for everyone. Experience the history of the railroad in Texas where one of its most important companies (the Gulf, Colorado & Santa Fe Railroad) started at the Galveston Island Railroad Museum. Admire the museum’s vast rolling stock collection, which includes a 1948 Southern Railroad dining car and an 1892 Southern Pacific Engine car. Then check out the meticulously arranged model train layouts before browsing the museum’s rotating exhibits that give an in-depth look at the history of the railroad. Feel the sand between your toes, feel the waves wash over you, and enjoy life on the beach at Galveston Island State Park. Swim, sun bathe, camp under the stars, paddle on one of several trails, explore the four miles of hiking and biking paths, and catch a trophy fish that will make your friends green with envy. With its varied ecosystems, the state park is a hotspot for birding and wildlife watching, so bring your cameras and binoculars. If you’re a fan of historic aviation, pay a visit to the Lone Star Flight Museum in Galveston. Get an up-close look at such iconic planes at a B-17 Flying Fortress, B-25 Mitchell, F4U-5 Corsair, and P-47 Thunderbolt. Along with the static aircraft displays, the museum supplies flight experiences in many of its planes, including the B-17 and B-25. Open daily except for Thanksgiving Day and Christmas Day. Explore the wonders of the world at Moody Gardens. Step inside the three colorful pyramids and you’ll be transported to the depths of an ocean and the canopy of a rainforest as you observe penguins, seals, monkeys, tropical birds, and other wondrous creatures. The third pyramid is home to a 3D and 4D theater that screens films both educational and entertaining. Visit the pyramids, then tour the museum, conquer the ropes course and zip line, and play a round at the lush on-site golf course. 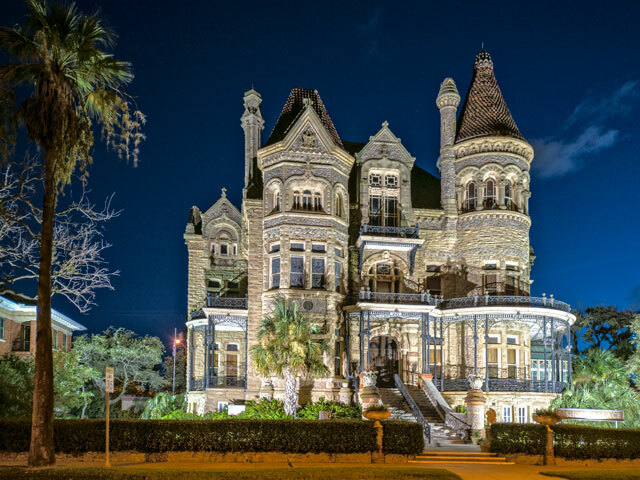 Galveston is full of breathtaking 19th-century homes, but Moody Mansion stands out. The red brick façade, stone arches, and distinct Romanesque-style turrets make the four-story, 28,000-square-foot house look like a castle. Once the home of the Moody family, the house is now a museum that provides a glimpse of life in a bygone era. The home is open for tours every day except Thanksgiving Day, Christmas Eve, Christmas Day, and New Year’s Day. For dining, shopping, and a few of Galveston’s best-known sights, head to Pier 21. It’s here you’ll find the famous 1877 Tall Ship Elissa docked at the Texas Seaport Museum, as well as the Ocean Star Offshore Energy Center’s oil rig. Catch a show at the Pier 21 Theater, go on a speed boat ride or a dolphin spotting excursion before settling in for some fresh seafood at one of the high-end restaurants in the area. From gravity-defying thrills to easygoing floats on a slow-flowing lazy river, Schlitterbahn Galveston Island Waterpark has it all. Take the 70-foot plunge down the 244-foot body slide of Rohr and experience the heart-stopping excitement of MASSIV Monster Blaster, the world’s tallest water coaster. With plenty of attractions and the 70,000-square-foot indoor waterpark, Schlitterbahn Galveston is a fun place to visit year-round. Seawolf Park, located on Pelican Island, is home to two legends of World War II: the USS Cavalla and the USS Stewart. The USS Cavalla submarine is best known for sinking the Japanese aircraft carrier Shokaku (a veteran of Pearl Harbor and the Battle of Coral Sea) on its maiden voyage, while the USS Stewart is one of the last remaining Edsall-class destroyer escorts in the world. Tour both ships and remember the brave deeds and sacrifices of those who served on ships like these. Native American cultural artifacts and contemporary 21st-century works of art are among the collection of 70,000 items spanning 12,000 years that is on display at The Bryan Museum. Housed within a former orphanage constructed in 1895, the museum showcases antique firearms, rare maps and books, portraits, and saddles, in addition to a rotating collection of art and artifacts. The museum is open Thursday through Monday. The Grand 1894 Opera House is no ordinary entertainment venue. This cultural icon built in 1894 and now known as “The Official Opera House of Texas” survived the devastating hurricanes of 1900 and 1915. Fully restored by the people of Galveston in 1974, it has come to represent the city’s resolute commitment to its culture and history. Today, you can catch a first-rate show nearly year-round in the three-tiered theater that features private boxes. Tickets to the plays, concerts, and other performances held at the theater are available on the venue’s website. Beautiful Victorian-style buildings that house a fascinating selection of art galleries, bars, hotels, restaurants, and museums reside within Galveston’s Strand Historic District. Many of the island’s attractions can be found in or near the district, such as The Grand 1894 Opera House, Pier 21, and the 1877 Tall Ship Elissa. Not only does The Strand have many treasures to call its own, it’s also a convenient place to stay before boarding a cruise at the Port of Galveston.